The Red Fort Complex is considered the final flourishing of Mughal architecture, combining Islamic, Persian, Timurid and Hindu traditions. 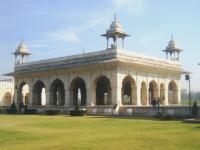 It was built in the mid-17th century, and became a symbol of power of Mughal emperor Shahjahan. It was the palace of his, Shahjahanabad. He moved his capital from Agra in a move designed to bring prestige to his reign, and to provide ample opportunity to apply his ambitious building schemes and interests. After 1857 the site was used as the headquarters of the British Indian Army. They introduced new colonial-style buildings and functions over the earlier Mughal structures. It was also the place where Indian independence was first celebrated, and is still celebrated today. Forts are among my least favourite WHS, and this one is no exception. To do it justice I have to say that it is much more than a fortress - It reminded me of the Forbidden City, with its endless rows of gates and audience halls, built to impress. The more interesting structures are at the back of the complex, after you have suffered the queue at the security gate (well, not much of it at the Ladies entrance) and the souvenir stalls at Chhatta Chowk. These structures at the back are all made out of white marble. I especially liked the Hammam. I arrived here with Delhi's Hop on Hop off Bus - an easy way to reach all 3 Delhi WHS in one day. At least - that's what I thought until I learned that the full circuit takes 4 hours to complete. And that is only the bus ride, sight visits of about 1 - 2 hours not included. So after Qutb Minar, Jantar Mantar and the Red Fort I decided to stop my efforts and returned "home" effortlessy by metro. This WHS is very similar to the red Agra Fort and could be quite confusing to discern when trying to recall both experiences. However, the Red Fort in Delhi is truly a national and worldwide heritage site and encloses several buildings, palaces, courtyards and gardens within its walls. I visited this WHS in January 2012. I have been to the Red Fort Complex myself and it can be very crowded in the evening there are quite little shops before entering the real Red fort complex. 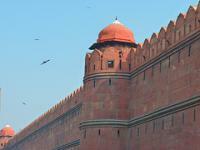 The Red Fort complex is extreamly similar to the Agra Fort in Agra. 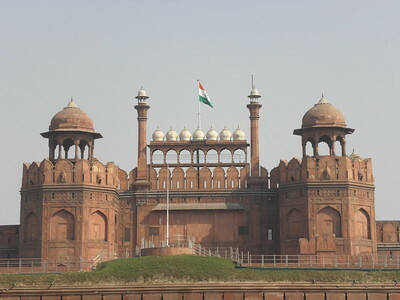 The fee for entering the Red Fort is 100 Rupees for adults and children are free. Lal Qila – The Red Fort – with its mighty red walls that extends for over 2 km is for sure the most important and majestic of all sights in Dehli. Construction was begun in 1638 by the mighty Mughal emperor Shah Jahan and was completed 10 years later. With its gates, palaces, bazaars, gardens, fountains and pavilions its and eloquent reminder of the glory of the Mugal era and its magnificence simply leaves one awestruck. It’s a calm haven of peace which helps one to break away from noisy and busy life outside the walls of the Fort, and transports the visitor to another realm of existence. And after having dreamt yourself away to another age and time you can return to the present at the little Tea House, were you quickly realize that you’ve been taken for a ride when receiving the bill..! Harem: "The Mumtaz Mahal, or Palace of Jewels, is the former harem of the Red Fort of Delhi.. Today it is converted into the Red Fort Museum of Archaeology"
Thomas Cook Round the World tour 1872-1873: c Feb 1873 "Delhi is one of the most interesting places in India, and its interest to English visitors was greatly augmented by the events of 1857. The great fort, encircling the late King's Palace; the rich marble structures of the Palace, baths, and harem; the pedestal on which stood the famed peacock Throne; the Great Mosque..."
Fusion: "fusion of Islamic, Persian, Timurid and Hindu traditions"